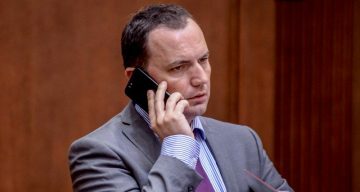 Deputy Prime Minister Bujar Osmani demanded the removal of law professor Tanja Karakamiseva, who is an outspoken critic of the Zaev Government, from the Venice Commission. Even though it is an independent body which should operate free from control of any Government, Osmani insisted that the divisive law on the use of the Albanian language will not be submitted to the Venice Commission “so long as Karakamiseva remains Macedonia’s representative there”. The unprecedented comment comes only days after Karakamiseva had police come to her home and scare her children while ordering her to report to a police station and answer questions about a comment she made on Facebook in which she criticized the Government. The charges against her were filed by the Helsinki Committee of Macedonia, a pro-Government organization which frequently targets critics of the ruling SDSM party with lawsuits and proposals that criminal charges are brought for political speech. I’m grateful to Osmani for showing his real face in calling me a “destructive element” who he and his coalition partners would “try to remove from the Venice Commission”. This “destructive element” is a constitutional law professor whose term lasts until 2020. Fortunately the laws about the use of minority languages do not depend on one professor Karakamiseva, or on you Osmani, but they must be in accordance with international and European documents, Karakamiseva said after being called out, adding that the “Venice Commission is not a village shop in (the DUI headquarters of) Mala Recica”. Karakamiseva added that she will inform the President and the Secretary General as well as all members of the Venice Commission of the pressures she is exposed to by the Macedonian Government. The Commission is supposed to evaluate the law, which would turn Macedonia into a bilingual country, making the Albanian language a second official language across the entire country.